Posted By:Unknown | At:7:30 AM Be the first to comment! BURBANK, Calif.—President Barack Obama defended the U.S. role in bringing down Libyan strongman Moammar Gadhafi, rejecting assessments that the international coalition he helped assemble amounted to "leading from behind." 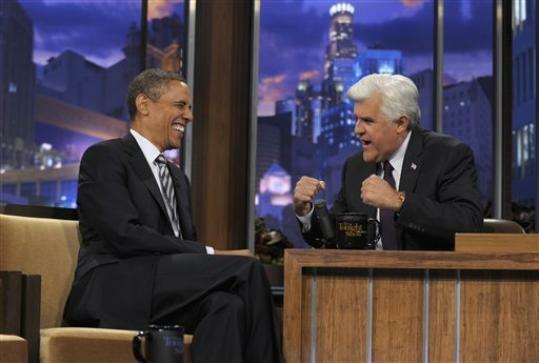 "We lead from the front," he told late-night television host Jay Leno on Tuesday. Laying out an argument for his emerging foreign policy doctrine, Obama distinguished the U.S. steps in Libya from the invasion and nine-year war in Iraq. He argued that by building a broad international alliance of European and Arab nations against Gadhafi, the United States saved American lives and money and achieved its goal. "Not a single U.S. troop was on the ground," he said. "Not a single U.S. troop was killed or injured, and that, I think, is a recipe for success in the future." Nudged by Leno in a notably sober first segment, Obama reflected on the meaning of Gadhafi's death, a gruesome and chaotic demise recorded on cellphone video for all the world to see. The president argued that Gadhafi had had an opportunity to let Libya move on a path toward democracy peacefully. "He wouldn't do it," Obama said. "And, obviously, you never like to see anybody come to the kind of end that he did, but I think it obviously sends a strong message around the world to dictators that people long to be free, and they need to respect the human rights and the universal aspirations of people." Still, Obama noted that the Pentagon never released photographs of terror mastermind Osama bin Laden after he was killed by U.S. Navy SEALs. "That's not something that I think we should relish," the president said. "You know, I think that there's a certain decorum with which you treat the dead even if it's somebody who has done terrible things."